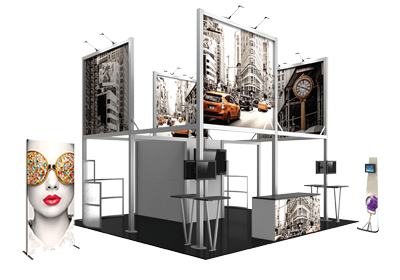 Hybrid Pro™ Modular Kit 03 is the ultimate 10ft x 10ft display kit solution. This custom modular display features high quality, push-fit graphics created with top-of-the-line technology, coupled with sturdy aluminum frames that are built to last. This display kit features a monitor mount and locking storage counter that can be further customized with graphics, as well as a fabric canopy and an illuminated panel to capture the attention of your audience. Foreground counter sold separately. - Backwall Counter: 21.75"W x 38"H x 17.75"D approx.